(SCENE) Announces A Call-For-Proposals: "Collage"
EAST LANSING, Mich. - East Lansing's alternative art space, (SCENE) Metrospace announces a call-for-proposals for an upcoming exhibit based on the concept and technique of collage. (SCENE) presents an in-depth investigation into an artform that has evolved from scissors, glue, and magazines into the contemporary fine art realm, encompassing assemblage, video and audio collage, and conceptual artworks. The exhibit will be juried by North Carolina-based Julie Thomson, whose dedication to collage includes self-publishing La Colle, a 'zine style journal chronicling collage artworks, as well as providing information and reviews about collage artists and collage-themed exhibits. Artists of all types are invited to submit current, original works for this juried exhibit. The exhibit will take place from October 27, 2007 through December 16, 2007. All entry materials are due Friday, October 5. Entry materials must include a current artist's biography and/or artist resume, as well as an artistic statement to accompany the proposed artwork(s). Submissions may be sent as .jpegs or .gifs, either on a CD mailed to the address below, or e-mailed to scenemetrospace@gmail.com. For more information, please contact Peter Richards at (517) 319-6832, or visit www.scenemetrospace.com. We are deeply saddened by the loss this week of Robert Busby, owner of Lansing's Creole Gallery. It was a sickening shock to hear of his death yesterday. Robert's gentle presence and defining role in re-shaping the Old Town neighborhood into an arts destination will never be forgotten. In a tangible way, Old Town itself is a physical manifestation of Robert's spirit, which was too big to be contained in a single person. His vision for Old Town and all of the arts was contagious, and he inspired others to be leaders. Our feelings stretch out to his family, friends, and all the people whose lives he enriched. If we can make even half of the impact you made on art and on the community, we will feel we have done a good job. We miss you Robert. (SCENE) Metrospace, East Lansing's alternative art and performance space, will soon be leaving it's home of three years at 303 Abbott. An exact date and destination are unknown at this time, but the former Kent Bank building on the corner of Abbott and Albert is slated for demolition sometime in 2007. Friday, January 19 - (SCENE) debuts "DATA TRANSFER," an exhibit of technology-driven art with a public reception from 6-9 PM featuring music by Blank Artists: a live set by Theater of the Absurd and a DJ set by Drew Pompa. Additionally, there will be interactive digital sand-painting on an illuminated sand table provided by David Ringlein. The public can produce and print their own full-color digital sand paintings! visit 517Noise for more details! This is a shared event spanning three communities and three venues: the DAAC in Grand Rapids and the Panopticon in Lansing. Noise artists appearing on the Friday and Sunday bracketing (SCENE)'s Saturday show include such noise movement luminaries as Dead Machines, Hot Tapes, Princess Dragon Mom, Aaron Dilloway, and Treebot. Thursday, January 25 - (SCENE) will host virtuoso marimba soloist Nathaniel Bartlett. Feauturing a state-of-the-art digital sound projection array, Bartlett plays "serious modern Western art music on a serious modern instrument - the modern marimba." We are pleased to stage this concert, which is open to the public. Doors open at 6:00 PM, the music begins at 7:00 PM, and there is a nominal cost of $5 for this unique sensory experience, offering "total immersion in sound." Seating is limited. Stay tuned for more breaking news, including the unveiling of our brand new website!! (SCENE) Metrospace is located at 303 Abbott Rd. in East Lansing, Michigan. Regular hours are Fridays and Saturdays from 6-9 PM and Sundays from 1-4 PM. Additionally, the gallery is opened through the gracious support of volunteers Wednesday, Thursday, and Friday afternoons from 1-4 PM. this post loses power without the accompanying graphics. HOUSTON, Texas â€“ This fall, the Contemporary Arts Museum Houston presents Wishing for Synchronicity: Works by Pipilotti Rist, the first comprehensive U.S. survey of the seminal work of the Swiss video artist. Organized by curator Paola Morsiani, the project brings together Ristâ€™s most significant work from the mid-1980s to the present. Wishing for Synchronicity: Works by Pipilotti Rist is on view through January 14, 2007, touring nationally following its Houston presentation. Wishing for Synchronicity: Works by Pipilotti Rist includes eight of Ristâ€™s early single-channel videos, six large projections, and three additional works. The exhibition features a selection of significant works spanning her career, such as Iâ€™m Not the Girl Who Misses Much (1986) and Sip My Ocean (1996), in which pleasurable images and music quickly become metaphors for hysteria and suffocation, and Ever is Overall (1997), in which the camera follows a female walking through city streets, smashing car windows with an iron flower as she meanders. Rist recently accepted a prestigious commission to create the visual identity for The Armory Show 2007, The International Fair of New Art, to be held next February in New York City. Rist was born in 1962 in Switzerland, and studied at the Academy of Applied Arts in Vienna, Austria and the School for Design in Basel, Switzerland. Her work has been shown at the Venice Biennale; the San Francisco Museum of Modern Art; the Metropolitan Museum of Modern Art, Tokyo; the Solomon R. Guggenheim Museum, New York; and the Museum of Contemporary Art, Chicago. She lives and works in Zurich, Switzerland. The independent documentary movement against the new Radio and TV National Law. Documentary, memory and social movements. 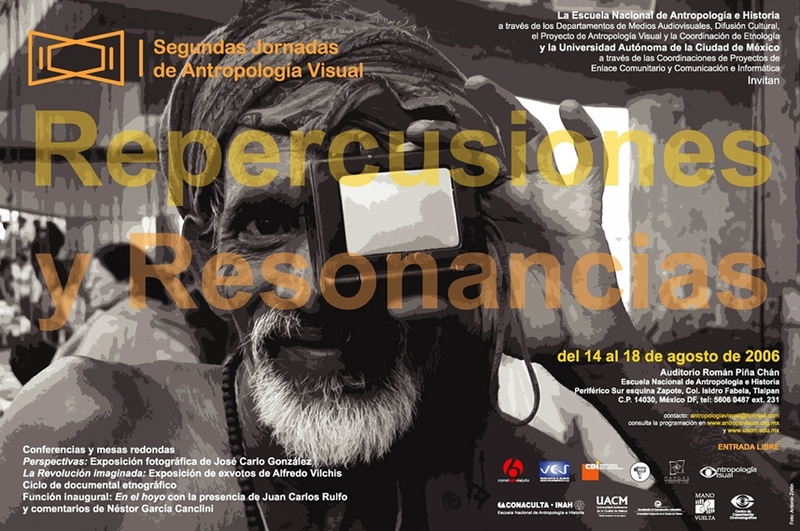 Institutional programs that promote viusal anthropology. From documentary to video-art and the philosophy of images. From August 14th to August 18th. Nacional School of Anthropology and History, Mexico City. An educational and entertaining experience featuring art, music, and 9 movies! "Anger: the Best Medicine" exhibit opens this Friday! ... also including a late arrival, a brand new sculpture by Matt Cygnet which will stop you in your tracks. CD Release March 25 / "They Die In Movies"
They Die In Movies is a narrative-based installation produced and directed by Jeni Mc, featuring fashions by Berry Noxon, and photography by Cody Hinze and Juan Beltran. It is film-themed and has been variously described as "a movie that never happened" and "a look through a director's eye." The exhibit takes place during the East Lansing Film Festival and continues on through May 13. Simultaneously, It Takes A Village To Make Records will release the much-anticipated "First-Hand Accounts, Theories & Their Repercussions" CD compilation. A double-length album on one CD, FHATATR is a genre-hopping collection of original independent music from all over the country. There will also be performances by Rai and Canada, as well as a screening of "Hello and Goodbye" by Detroit's Test Pattern Pictures. We thank "They Die In Movies" for graciously hosting our CD release. Folk Songs for the Five Points is a digital arts project that allows you to create your own â€œfolk songsâ€� by remixing and overlaying a range of sounds taken from New Yorkâ€™s Lower East Side. The SoundMap features a visual representation of the Lower East Side, overlaid with a series of dots. Each dot represents an audio sample recorded at that particular place. To select a sample, click and drag one of circles over the chosen dot. The sample will then automatically start playing. Folk Songs for the Five Points is a celebration of cultural diversity and change, using â€œfolk songsâ€� as a metaphor to explore immigration and the formation of identity in New Yorkâ€™s Lower East Side. The project isnâ€™t about absolute answers or clear definitions. We are celebrating the unexpected richness that confronts you at every turn â€“ from the many languages of Canal St to the endless complexity contained in words like â€œimmigrantâ€� and â€œfolk songâ€�. This is a benefit concert for "They Die In Movies," a non-traditional look through the camera-eye of an unrealized film. "They Die In Movies" is directed/produced by Jeni Mc with fashion and costume design by Berry Noxon, photography by Juan Beltran and Cody Hinze, and "product placement" by local artists. EAST LANSING, Mich.â€” (SCENE) Metrospace announces the opening of its latest exhibition, â€œCirâ€¢cus/Carâ€¢niâ€¢valâ€� on Friday, Nov. 18. â€œCirâ€¢cus/Carâ€¢niâ€¢valâ€� explores the imagination, oddities, animals, wonder, excitement, and misfortunes of the events that have become a cultural tradition: the Circus and the Carnival. â€¢ New Jersey based photographer Melanie Heinrich has spent over 30 years of her life documenting behind the scenes of the carnival will display her prints and documentary. â€¢ Beulah based Tara Hackettâ€™s mixed media paintings capture the charm and history of the traveling circus and carnival throughout the 50's and 60's. â€¢ Krys Tourtois, a Lansing based artist will explore an unromanticized and often overlooked aspect of the carnival experience in her paintings of sideshow women. â€¢	Detroit based Carl Oxley explores a happy-go-lucky and exciting view in his colorful pop-art paintings. â€¢	Ann Arbor based Amanda Miller will display her mystifying freak show paintings. â€¢	Lansing based artist Tim Lane will display a quirky and fun carnival game installation. â€¢ Farmington Hills based mosaic artist Ellen Stern expresses an imaginative spin on the circus with her ceramic, fiber, and installation works. â€¢ Highland and Detroit based artists Chris Sandon and Jason Lee Starin will team up to make humorous psychedelic folk art that illustrates the stranger side of the events. â€¢ Saginaw based artist Janie Peters will uncover a darker aspect of the circus and carnival, the mistreatment of animals, with her mixed media sculpture. â€¢	Lansing based artist John Kroneman will explore his personal roots to the circus with paintings of his ancestors. â€¢ Columbia, MO based artist Claudia Drake uses digital collage, fusing together antique engravings into her own juxtapositions to express her vision of the carnival. â€œCirâ€¢cus/Carâ€¢niâ€¢valâ€� opens with a free public reception at (SCENE) Metrospace on Friday, Nov. 18 from 6-10 p.m. The reception will feature a special circus-themed performace from Lansing spacerock favorites, Calliope. Circus and carnival themes events, games, and excitement will take place all throughout the evening. All food will be graciously provided by Spartan Signature Catering. All ages are welcome, costumes are encouraged, and space is limited. FRANK PAHL (www.frankpahl.com) is one of the most distinctive and charming voices in contemporary American music. He has received numerous awards, grants, and residencies for his innovative compositions using homemade automatic instruments. Inspired by the works of Trimpin and Pierre Bastien, Pahl began to delve deeply into the creation of automatic instruments, using these instruments as the fundamental foundation of his compositions. His work has included pieces for automatic string quartet, automatic doorbell quartet, and bicycle quartet. Pahl has received over 60 commissions for theater, film and dance and his music appears on over 60 releases. His latest band, Little Bang Theory, is named after the essay of the same title by the improvising musician Frederic Rzewski. Rzewski describes an approach to music well suited to improvisation. Basically each note can be seen as a little bang, with the possibility of introducing a new universe of music. Though the band performs on toy instruments the music runs the gamut from improvisation to toypop to soundtrack-inspired music...not easy to describe...best to see. Toy Suite #2 was made possible by a 2005 Meet the Composer grant. Frank Pahl's Little Bang Theory with special guest Nick Schillace. This show is sponsered by UMMA and WCBN. NICK SCHILLACE (www.nickschillace.com) is a Detroit area composer, teacher, and musicologist exploring what it means to be an American musician. In 2002 he completed a graduate thesis on the late guitarist John Fahey, and utilizes Fahey's self-described style of syncopated "American Primitive" fingerstyle guitar as the foundation for his own technique. This style, based on early forms of blues, folk, and old-time music, provides the perfect foundation for larger and more expansive musical compositions incorporating a wide range of his own idiosyncratic influences. He has been touring extensively both locally and nationally since releasing his debut acoustic instrumental album "Box Canyon" in June 2005. He also writes and performs with the groups indoorpark and Big Lake Trawler. beautifully played songs for acoustic guitar"
of the traditional and fueled by an expression of a truly original voice." The show was really well attended. What a fun concept, superbly executed. The Museo del Estado in Morelia, Mexico is holding an exhibition of the work of Antonio ZiriÃ³n entitled Pasos, en homenaje a Henri Cartier-Bresson. Antonio is an active member of OCC, contributing work to both 03/05 issues of JOWAI and the 05 issue of JOMAS. Congratulations Antonio! Click on the image at right to view.